Oceania has always been at war with Eurasia…. Exciting news! World War III is busting out all over – in the Middle East, Eastern Europe, and East Asia! For perplexed souls wondering how the earth got itself into such a sorry mess, here’s a political lexicon to help make sense of it all. Terrorism: Extreme violence directed at U.S. interests. Shock and Awe: Extreme violence directed at people the U.S. doesn’t like. e.g. Saddam Hussein. Freedom Fighter: Anyone who practices extreme violence in an authorized manner, e.g. Osama bin Laden when he was fighting the Soviets in Afghanistan. Terrorist: Anyone who practices extreme violence in an unauthorized manner, e.g. Osama bin Laden after he turned against the United States in 1998. Islam: Noble religious tradition dating from the seventh century. Islamism: Noble religious tradition taken to political extremes. Jihad: Noble religious tradition taken to violent extremes. Laudable when aligned with U.S. interests as in Afghanistan in the 1980s. (See “freedom fighter.”) Reprehensible when not. Sectarian: Any Shiite who behaves in a way prejudicial to Sunni interests, e.g. Iraqi prime minister Nuri al-Maliki. Non-sectarian: Any Sunni who behaves in a way prejudicial to Shiite interests, e.g. King Abdullah of Saudi Arabia. Extremist: Any Muslim who turns Islam into a source of hatred and fanaticism, e.g. Al Qaeda, Al-Nusra, Islamic State of Iraq and al-Sham (ISIS). Moderate: Any citizen of a pro-U.S. Persian Gulf state even if he funds Al Qaeda, Al-Nusra, or ISIS. Axis of Evil: Formerly Iran, Iraq, and North Korea, but since reconfigured now that Baghdad is in the U.S. fold and Iran may be needed to beat back ISIS. Putin’s Russia and Nicolas Maduro’s Venezuela may be added at some future date. Bush Doctrine (“If you harbor a terrorist, you’re equally as guilty as the terrorists”): Formerly applicable to Syria, Iran, and Afghanistan under the Taliban, but never to Saudi Arabia even though Hillary Clinton admitted back when she was secretary of state that Saudis “constitute the most significant source of funding to Sunni terrorist groups worldwide.” Kuwait and Qatar are also exempt, as are Turkey and Jordan even though they have allowed terrorists to use their territory to stage attacks inside Syria. Applicability to Iran currently uncertain. Democracy: Essential goal for all Middle Eastern states except certain Sunni oil producers in the Persian Gulf. Repression: What Bashar al-Assad did in crushing popular protests in 2011. Restoring Law and Order: What U.S. ally Bahrain did in crushing popular protests in 2011. 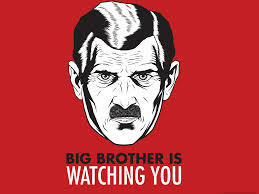 Propaganda: Information, communications, etc. contrary to U.S. interests. Crude propaganda: Russian information, communications, etc. contrary to U.S. interests. Caricatures in the American media’s fun-house mirror: Contradiction in terms since U.S. media are always rigorously objective. World War II: Great military conflict won by Tom Hanks at D-Day. Battle of Stalingrad: Great military conflict that can be safely ignored since everyone knows the combatants were morally indistinguishable. For an extended disquisition on Soviet-Nazi moral equivalency, see Timothy Snyder, Bloodlands: Europe Between Hitler and Stalin, 2010. Safe Haven: Something that John Kerry says that ISIS must absolutely be denied, except in Syria where the U.S. has been providing it for years by sponsoring sectarian warfare against the Assad regime. Political debate: A process that lesser countries engage in but never the U.S. because Americans know what’s right without even having to think about it. Indispensable nation: America due to its unerring moral compass. American exceptionalism: The doctrine that the aforementioned moral compass exempts the U.S. from ordinary legal standards and allows it to assume the role of global dictator. Energy conservation: Something for dispensable nations to worry about. Bonus question: How do you tell a good neo-Nazi from a bad neo-Nazi? Answer: A bad neo-Nazi is someone like France’s Jean-Marie Le Pen, who taunts Jews and makes light of the Holocaust. An even worse neo-Nazi is one who gains real political power, e.g. the Jobbik Party following its strong showing in the Hungarian elections last January or Jörg Haider when his far-right Austrian Freedom Party became part of the ruling coalition in the year 2000. But a neo-Nazi who becomes part of a pro-U.S. government in an important swing state is another story. This is why Svoboda Party leader Oleh Tyahnybok, who once railed against “the Moscow-Jewish mafia” ruling the Ukraine, was granted a friendly photo op with assistant U.S. secretary of state Victoria Nuland in February. Anti-Semitism is very bad unless it’s on the side of the U.S., in which case it’s no longer anti-Semitism at all. 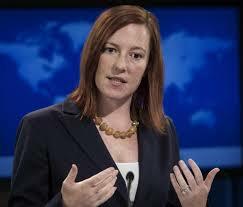 State Department spokesman Jen Psaki: Budding young war criminal. PSAKI: Well, that’s the opposite of what the Iraqi people need right now, and we have continued to make the case to Prime Minister Maliki – Ambassador Beecroft met with him just yesterday – that taking steps to govern in a nonsectarian way, to be more inclusive to increased support to the security forces is what his focus should be on. And this is obviously the opposite of what that is. It’s inaccurate and, frankly, offensive. PSAKI: The comments that he made. QUESTION: What is inaccurate and offensive? QUESTION: Would you say that Maliki is basically fanning the flames of sectarianism? PSAKI: I think I would say there’s more that can be done to be more inclusive and govern in a nonsectarian manner. QUESTION: And one more – sorry James – on this. Saudi Arabia called the events in Iraq a Sunni revolution, adding that the sectarian – that the exclusionary policies in Iraq over the past three years are behind the recent unrest in the country. Do you agree with the Saudis on this? PSAKI: Well, I – the way we see this is that the situation is complex, and there are some tribes and key local Sunni politicians have joined with the Iraqi Government. Others are working with ISIL through violence to destabilize the government. Those working with ISIL are, of course, supporting terrorists who adhere to an extreme ideology, which believes that Shia should be killed based on their sect alone. Obviously, our view is that there needs to be – the way that Iraq is governed by the leaders needs to take into account the legitimate grievances of all of the people. QUESTION: That means you don’t agree with them that what’s happening is a Sunni revolution? PSAKI: I think I made my comments clear. Donors who already harbor sympathies for Syrian extremists have found in Kuwait fundraisers who openly advertise their ability to move funds to fighters in Syria. Constraining this flow of funds is particularly challenging in an era when social media allows anyone with an Internet connection to set himself up as an international terrorist financier. We see this activity most prominently in Kuwait and Qatar, where fundraisers aggressively solicit donations online from supporters in other countries, notably Saudi Arabia, which have banned unauthorized fundraising campaigns for Syria. Many of the most vocal Arab backers of Syria’s rebels support what they cast as an Iraqi popular revolution against an Iranian-backed sectarian despot. They equate the Iraqi uprising with the Syrian uprising, as a Sunni revolution against a Shiite tyrant, and actively oppose U.S. or Arab intervention against it. For the West or Iran or the two working together to fight beside Maliki against Sunni Arabs will be seen as another conspiracy against Sunni. Psaki’s failure to forthrightly condemn the characterization of the ISIS offensive as a “Sunni revolution” indicates that the State Department is struggling to accommodate the Saudi perspective. So Obama is not heading off in a new direction after all, but standing by his old policy of endlessly appeasing Persian Gulf interests. Or, to put it a bit more kindly, he’s trying to head off an all-out sectarian war involving Iraq, Iran, Syria, and possibly the gulf states too by reassuring Riyadh that he continues to tilt in its direction. But it still means the same thing, i.e. countenancing mass murder or at least not opposing it too strenuously. Has American policy ever been more bankrupt? Sorry, but what government is more aggressively sectarian than Saudi Arabia’s? Riyadh terrorizes propagates ultra-Sunni Wahhabism throughout the world, it terrorizes its own 15-percent Shiite minority into submission, and in March 2011 it sent troops to crush a democratic protest movement among Shiites in neighboring Bahrain. Non-sectarianism is an absolute necessity for Iraq, yet Saudi Arabia gets a free pass. How do these people look themselves in the mirror? 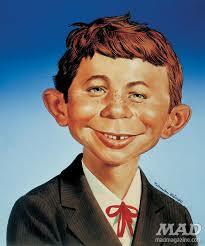 Alfred E. Neuman: The genius behind U.S. Mideastern policy? The disaster in Iraq has exposed a rich vein of incompetence not only in the White House but in the press. In a recent column, Roger Cohen points out in the Times that the U.S. invasion of Iraq, carried out under entirely false pretenses, has backfired in any number of ways. It has played into the hands America’s nemesis, Iran, while infuriating Saudi Arabia, a key ally. It upset the Sunni-Shiite balance of power, leading to the all-oout sectarian warfare that is now engulfing the region. It encouraged the growth of Al Qaeda in Iraq and has forced Washington to seek help from Tehran. Yet help is not likely to be forthcoming due to resistance everywhere from Riyadh and Tel Aviv to Capitol Hill. In the end, Cohen throws up his hands and declares: “A logical approach in the Middle East is seldom a feasible approach.” Nonsense. It is not logic that got the U.S. into this mess, but a tower of illogic that neocons like Cohen have helped build up to frightful proportions. Why is U.S. policy in the Middle East such an utter mess? Let us count the ways. The United States pretends to oppose militant Islam yet allies itself with Saudi Arabia, Qatar, Kuwait, and other Persian Gulf states that are the prime funders of jihad throughout the globe. In a secret 2009 memo made public by Wikileaks, then-secretary of state Hillary Clinton observed that the Saudis “constitute the most significant source of funding to Sunni terrorist groups worldwide.” Yet Washington has done nothing to force the Saudis to turn off the spigot. To the contrary, Obama has fairly fawned over the Persian Gulf tyrants, bowing low to Saudi King Abdullah during a G-20 summit meeting in 2009 and absurdly praising Qatar’s Hamad bin Khalifa al-Thani for promoting democracy everywhere but in his own country. The U.S. claims to oppose religious fundamentalism, yet supports Saudi Wahhabists who, since the 1980s, have funded the construction of thousands of mosques and madrasas from Indonesia to London, every last one a breeding ground for violence and intolerance. It claims to oppose religious sectarianism, yet, directly or indirectly, has backed sectarian forces in Syria and Iraq that are now slaughtering every last Shiite they can get their hands on. It claims to back only moderate, secular forces in Syria. Yet the Free Syrian Army, the chief object of its affections, has been implicated in anti-Christian atrocities and has collaborated militarily with Al-Nusra. The U.S. has never officially repudiated George W. Bush’s absurd “Axis of Evil” rhetoric even though it now seeks a rapprochement with Iran, number two on Dubya’s list of evil-doers. It tosses the “terrorism” label about with abandon despite the facet that years of misuse have rendered the term all but meaningless. It has provided Israel and Saudi Arabia with open-ended security guarantees that effectively allow either country to lead it about by the nose. With ISIS now tearing Iraq into little bits and pieces, it is therefore at a loss over what to do. If it allies with Iran, it will infuriate both Riyadh and Tel Aviv. If it doesn’t, it will have to stand by and watch as Iran, Iraq, and likely Syria as well form themselves into a Shiite arc of resistance while ISIS carves out a caliphate extending from t the Tigris and Euphrates he Mediterranean. It claims to want nothing more than stability in the Middle East, yet by pouring hundreds of billions of dollars a year into the region in the form of energy revenue, much of which is then used to purchase U.S. military hardware, it is pouring oil on the fire. Saudi Arabia is a basket case. Besides oil, it exports nothing but Qur’ans and holy warriors. It devotes 13 percent of GDP to the military (Israel devotes only about 9 percent)l, yet in the event of a real war it would be a sitting duck. Besides oil, it exports nothing other than Qur’ans and holy warriors. Yet the Obama administration is tied to it hand and foot. The U.S. has done nothing to rein in a monstrous oil economy that is at the heart of today’s turmoil. Even Thomas L. Friedman is occasionally right about certain things, and one of those is a carbon tax, which, if adopted, would have a wide range of positive effects. It would reduce CO2 output, it would reduce highway congestion and suburban sprawl, and it would send energy prices falling through the floor. With the Persian Gulf states losing much of their economic clout, funding for groups like ISIS would plummet. Yet the U.S. is paralyzed. It prefers to watch its empire collapse all around it rather than engage in meaningful reform. This is the equivalent of a four-way head-on collision. U.S. policy in the Middle East is so rickety and absurd that the entire structure is now crashing down around us. Ordinary people could not come up with something so ridiculous. Rather, it took some of the best minds in the country working together for decades on end. Unchastened, neocons are now scouring the globe for fresh disasters in the making – in the Ukraine, in the Baltic, and perhaps the East China Sea. Is this the way empires end, not with a ban or a whimper but a sigh of confusion?